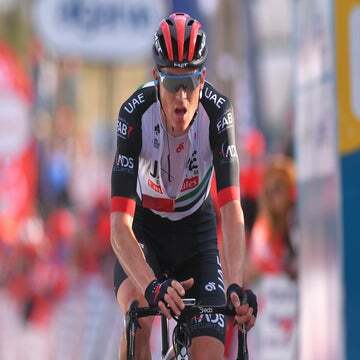 GENEVA, Switzerland (AFP) - BMC's Cadel Evans won the Tour de Romandie on Sunday after the fifth and final stage was claimed by Team Sky's British rider Ben Swift. GENEVA, Switzerland (VN) — Any stage race would like to have a final podium as distinctive as 1. Cadel Evans, 2. Tony Martin and 3. Alexander Vinokourov. And that result after six days of always fascinating and sometimes dramatic racing at the 65th Tour de Romandie was fully deserved. Just as distinctive was Sunday’s stage 5 into Geneva that culminated in a brilliantly executed win for Team Sky’s enormously talented British sprinter Ben Swift, 23, right next to the Swiss city’s world-renowned water-jet fountain that plumes 460 feet out of the lake. The mood in the Sky camp was not as upbeat last Friday in Neuchâtel, when Swift’s teammates failed to close down a late attack by HTC-Highroad’s Martin, Team Astana’s Vinokourov and AG2R-La Mondiale’s Frenchman Mikael Chérel, and left their swift Brit sprinting for fourth place ahead of Freire. Also pleased with their day’s work, as well as the whole week, were Evans and his BMC Racing colleagues, who controlled Sunday’s final stage to perfection. Other than losing team prodigy Taylor Phinney — who rode tempo for the team over the first two hours, then got dropped a day after his spectacular time trial crash, and rode the second half alone to come in 23 minutes back — the American squad had the look and feel of one that will support its Australian leader very well at this year’s Tour de France. Evans pulled of this second Tour de Romandie win five years after his previous success by riding with great intelligence, race smarts and making use of his innate strength, even if it were at only 80-90 percent of his top form. His team did underestimate the first road stage’s breakaway that saw Russian Pavel Brutt of Katusha take the yellow jersey in the mountains at Leysin; but the Aussie almost pulled off a stage win at Romont the next day, only losing to Lampre-ISD’s Damiano Cunego after a weary Chérel unwittingly broke the Aussie’s uphill sprint. Another misstep was Evans not expecting that late move by Martin and Vinokourov to go all the way in Neuchâtel; but he more than made up for those minor mistakes with his superb time trial on Saturday. An analysis of his ride in that 20.1km stage shows that though, like the other late starters, he was slowed by a head wind on the first part of the U-shaped course, Evans aced the final part. After 9km, he was 28 seconds slower than Martin (and level with Vinokourov), but when he cut lose in the finale, especially on the 1km climb to the hilltop finish at Signal de Bougy, 1,000 feet above Lake Geneva, Evans was phenomenal. He raced the last 12.1km at 52.105 kph in 13:56, which was 10 seconds faster than Martin, 29 seconds better than Vinokourov, and even 13 seconds faster than stage winner Dave Zabriskie of Garmin-Cervélo. Besides Evans’ overall win by 18 seconds over Martin and 19 seconds on Vinokourov, there were encouraging rides by HTC’s Marco Pinotti, taking fourth before he heads to next week’s Giro d’Italia, and the ninth place by Garmin’s highly promising Andrew Talansky — who finished only 59 seconds behind Evans six days after placing last in the prologue, where he conceded 54 seconds to Evans because of an unfortunate crash on the second turn. If you do the math, that crash probably cost Talansky a place on the final podium Sunday. But the 22-year-old American had some recompense in winning the best young rider’s white jersey (by 1:15 over teammate Peter Stetina). And those two played a major part in Garmin winning the overall team prize by 2:15 over Spain’s Movistar and 3:32 over Luxembourg’s Leopard-Trek. The Romandie race director Richard Chassot said after the finale on Sunday that this year’s 65th edition was “a good vintage” in terms of the podium, and that it was especially memorable that overall winner Evans’ first home in Europe was in Romandie, back in 1998 when the Aussie was a 21-year-old mountain biker. Chassot also said this year’s course was somewhat “soft” and that the 2012 Tour de Romandie will see a return to the high mountains, with the finish scheduled for the ski resort of Crans-Montana. 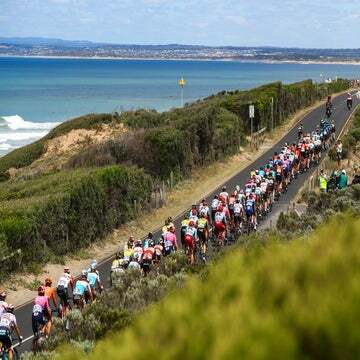 If that’s the case, Cadel Evans won’t be complaining. 2. Davide Vigano (ITA), Leopard-Trek, s.t. 3. Oscar Freire Gomez (ESP), Rabobank Cycling Team, s.t. 4. Fabio Sabatini (ITA), Liquigas-Doimo, s.t. 5. Enrico Gasparotto (ITA), Astana, s.t. Check back soon for more photos and a complete report from VeloNews’ John Wilcockson.